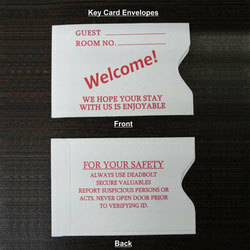 Key Card Envelope are offered in multi color print. They can be customized. SWAN INTERNATIONAL is based in Mumbai, India & is engaged in the business of manufacture & export of Printed Paper Cups & Specialty Paper Cups for Hot & Cold beverages. We are an integral part of a 55 year old Industrial Group engaged in the Paper, Printing & Packaging businesses. Triple Walled Ripple Paper Cups for Hot Beverages are designed with a rippled outer wall so as to provide much needed insulation against hot content while it is being held in the hand. They also ensure that hot beverages are kept as hot as possible for as long as possible while being just cool enough to handle. This style of design provides not only good insulation but also an extremely strong cup. Our new introduction Double Walled Paper Cups for Hot Beverages are designed with a thick plain outer jacket so as to provide insulation against hot content. This cup style & design provides good insulation with added advantage of a plain outer jacket that offers scope for more clearer & vibrant printed graphics. We also offer sip through lids which are suitable for use with hot drinks. At Swan International, we are involved & contribute actively to the cause of "Go Green". All our paper cups can be recycled in the same way as milk cartons or tetra packs are currently being done. Our entire set is centrally organized and production in all areas is ably supported by a strong technical team. Good Manufacturing Practice along with well-maintained machineries help us to turn around orders faster. We have an in house graphic designing and printing studio. We work very closely with our buyers to develop & customize their products. Minimum Order Quantity for each Product: 25000 Pieces.